Using a mouse model of necrotizing enterocolitis (NEC) — a potentially fatal condition that causes a premature infant’s gut to suddenly die — researchers at Johns Hopkins say they have uncovered the molecular causes of the condition and its associated brain injury. The discovery enabled the team to combine efforts with colleagues studying brain inflammation and to identify potential drugs that reverse the brain injury in mice. Details about the study and findings appear in this week’s Science Translational Medicine. While the exact causes of NEC in newborns were unclear, the disease is known to occur in premature infants who are fed formula and suffer other stressors, such as bacterial infections. So the team developed a mouse model of NEC by separating newborn mice from their mothers and feeding them formula, subjecting them to a low oxygen chamber twice a day for four days as a stressor and making sure they had similar gut bacteria by feeding them stool from a child who had developed severe NEC. According to Hackam, not only did these mice develop NEC, their brains also showed the same injury as seen in humans and impaired brain function when older. At this point, they were ready to figure out what was causing NEC-associated brain injury in these mice. First, they looked at whether the immune cells of the brain, so-called microglia, were activated in these NEC mice, which would signify some sort of inflammation. Indeed, the microglia were activated. Others had shown that a protein called TLR4, which binds to bacteria in the gut, is also able to activate microglia in the brain. So they genetically engineered mice to not contain TLR4 on the microglia and gave these mice NEC. The researchers found that these mice did not develop NEC-associated brain injury, suggesting that TLR4 is the cause of that injury. The team then sought to understand what it is about this gut condition that leads to brain injury. Their previous research had revealed that TLR4 protein was also in the gut. According to Hackam, TLR4 is present in the developing fetal gut at high levels. Those levels drop in full-term infants after delivery. Infants born prematurely, however, maintain high levels of TLR4 in their gut. TLR4 in NEC guts cause cells to release another protein, HMGB1. The team engineered mice to lack HMGB1 and then gave them NEC. 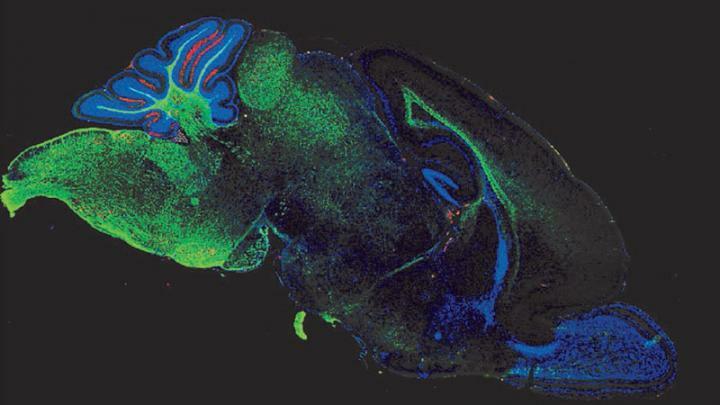 These mice showed less microglial activation in the brain than nonengineered mice with NEC, implying that, indeed, the HMGB1 generated by TLR4 in an inflamed gut is the cause of NEC-associated brain injury. The work originated through a chance conversation. “One of the cool things about Johns Hopkins is that it’s full of smart people studying all kinds of things. One of the first people I met when I came here in 2014 was Sujatha Kannan, who was studying brain injury in rabbits and had recently shown that an anti-inflammatory applied to the brain of rabbits could prevent cerebral palsy,” says Hackam. So, Hackam and Kannan teamed up to see if this would work in NEC mice. They fed nanoparticles containing antioxidants and tagged with a fluorescent molecule to mice with NEC and examined mouse brains to see where the glowing molecules accumulated. Sure enough, the brains glowed in the same brain regions where activated microglia are found. Additionally, these brains contained fewer activated microglia, suggesting that the nanoparticle drugs could protect the brain from NEC-associated brain injury. “We really had to change our thinking from NEC being not only a gut condition to really being a gut-brain condition,” says Hackam. “While this condition manifests more immediately in the gut, neonatologists should also focus on a brain-protective strategy, which could include surgery sooner, gut rest and antibiotics. In addition to Hackam, authors on this study include: Diego F. Niño, Qinjie Zhou, Yukihiro Yamaguchi, Laura Y. Martin, Sanxia Wang, William B. Fulton, Hongpeng Jia, Peng Lu, Thomas Prindle, Fan Zhang, Joshua Crawford, Zhipeng Hou, Susumu Mori, Liam L. Chen, Andrew Guajardo, Ali Fatemi, Mikhail Pletnikov, Rangaramanujam M. Kannan, Sujatha Kannan and Chhinder P. Sodhi, all of Johns Hopkins. This work was funded by the National Institutes of Health R01GM078238 and R01DK083752. Sujatha Kannan and Rangaramanujam Kannan have filed a patent for the use of D-NAC in the treatment of neurological disorders, including NEC (PCT/US2015/045112), and Rangaramanujam Kannan and David Hackam have filed a patent C13800,” Nanoparticles for the diagnosis and treatment of neonatal necrotizing enterocolitis,” which is exclusively licensed to Ashvattha Therapeutics, LLC. COI: Under a license agreement between Ashvattha Therapeutics, LLC and the Johns Hopkins University, Dr. Kannan Rangaramanujam, Dr. Sujatha Kannan, Dr. David Hackam, and the University are entitled to royalty distributions related to technology described in the study discussed in this publication. Drs. Rangaramanujam and Kannan are founders of, and hold equity in, Ashvattha Therapeutics, LLC. Dr. Rangaramanujam also serves as the company’s Chief Technology Officer, and Dr. Kannan serves as the Chief Medical Officer. This arrangement has been reviewed and approved by the Johns Hopkins University in accordance with its conflict of interest policies. To download the image and to access additional assets, please visit the newsroom.